Your Premier Choice in Disc Jockey Entertainment! 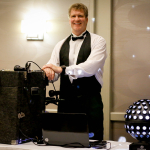 Shamrock Sounds – Dublin’s Premier Choice in Disc Jockey Entertainment! Shamrock Sounds’ single owner/operator, John Curry, located in Dublin, Ohio has earned a flawless reputation since 1994 as THE person to call for Top-Notch Disc Jockey Entertainment. I sincerely feel that the choice you make for your musical entertainment makes or breaks your event. I feel it is very important to hire a Professional Disc Jockey Company offering a personal experience in which the service is provided by the owner, who provides State-of-the-Art Sound and Lighting Equipment, plays the songs you select and can transform your event into something your friends and family will be talking about years from now. 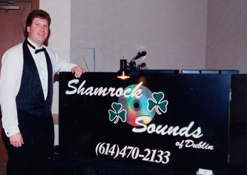 Allow me please to introduce you to my company, Dublin, Ohio’s popular and most referred Mobile Disc Jockey Company… SHAMROCK SOUNDS. “We Just Had The Best Party Ever!! !” First-Rate Fun! My personal passion for music and the responsibility of entertaining hundreds of people at a reception is what my business is all about. I offer my clients first-rate fun, an outstanding mix of music, and a high level of professionalism and experience! I’ve built my reputation by listening to my customers and performing beyond their expectations.